I’m not talking about environmental though. I’m talking about getting your greens in your diet; things like kale, beet greens, dandelion, collards, and others. Need a few good reasons to make sure you take in plenty of leafy greens regularly? Chlorophyll – the molecule that gives plants their green color is found in abundance in greens. Chlorophyll is a natural wonder – it can help detox your system. Watch for dark green leafy matter to get the highest amount. Greens are an excellent source of fiber, and can actually contribute very little to your carb intake. Fiber is essential to the proper functioning of your digestive system, and to help transport toxins out of your body. Fiber can help you feel full longer so you wont be as tempted to snack on unhealthy foods. Greens are also a powerhouse of nutrients. Again, the darker the leafy greens, the more packed they are with chlorophyll and other nutrients. Calcium (in a form readily available for your body! ), magnesium, potassium, Vitamins C and K are a few of the important nutrients you’ll gain from consuming greens. One of the best benefits is all that by taking in greens, you’re not only getting good things into your system – you’re also getting bad things out. Greens have a remarkable ability to help detox your system. By taking in greens you can help reduce damage and remove toxins from your system. Keep in mind that greens are also relatively low calorie. This puts them high on the “bang for the buck” ratio – even a large bowl (or glass if you juice) of greens won’t push you into a larger waist size. You might find that not only are they low calorie, but they are very satisfying and will help defer other cravings as well as displace other unhealthy foods in your diet. You can choose to add your greens as a side to other dishes, use them mixed in a salad, or blend or juice them. 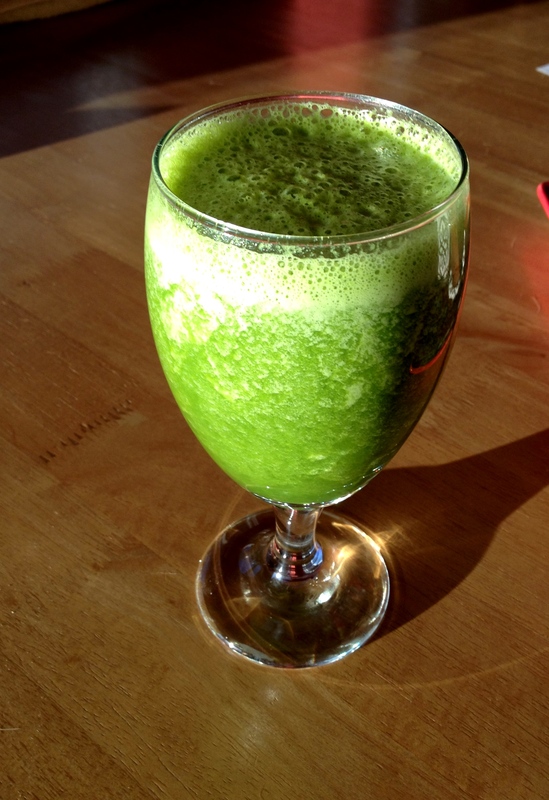 Juicing is my favorite; I use a Vitamix to completely blend greens with some lemon (sometimes a little pineapple or other fruit thrown in) – delicious, and easy to take in the equivalent of a large salad in a large glass or tumbler. But you have to eat (or drink) them to get all these great benefits. Add greens to your shopping list the next time you head to the grocer –or even better, find them at your local farmers markets. As always – try to get organically raised greens if possible. Previous PostPrevious An apple (or two) day ….